NO…. There is NOTHING Wrong with THAT house! Curious to learn more about the gorgeous Lyman Estate that’s right in our neighborhood? 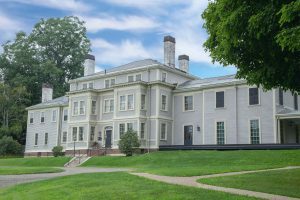 Also known as “the Vale,” The Lyman Estate was established in Waltham in 1793 and finished in 1798 as the Lyman family summer residence for over 150 years. 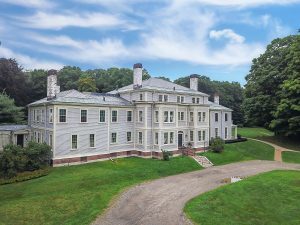 Boston merchant, Theodore Lyman helped establish this property on 400 acres of grounds. The grounds consisted of the mansion, its lawns, gardens, greenhouses, woodlands, a deer park, and a working farm. The estate had a greenhouse constructed before 1800 is now thought to be the oldest in the United States. As mentioned before, the building was completed in 1778 by Salem architect Samuel McIntire. The building is composed of amazing features, that is highlighted by the grand ballroom with high ceilings, large windows, a marble fireplace, decorative frieze and more that was used for formal parties. 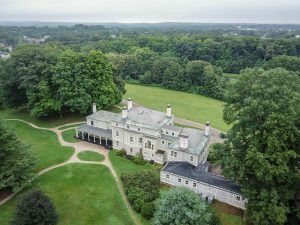 In 1970, the estate was designated as a National Historic Landmark for how its architecture and landscape have stayed intact from its original design. It’s owned by the nonprofit Historic New England organization. The estate is open free of charge to anyone daily, and an admission fee is required for entry into the house. The Lyman Estate is very popular for private events including weddings, parties and corporate events. With 37-acres of lawns and gardens, the Lyman Estate is the ideal location for corporate events, weddings, business meetings, and holiday parties. The property offers both indoor and outdoor areas that feature a covered veranda overlooking the grounds, antique-filled parlors, a magnificent ballroom, and five different rooms that are available for use. The Lyman Estate Greenhouses are known for being the oldest greenhouses in the United States. The complex features four separate greenhouses where users can purchase plants to take home. Not sure where to start? The horticultural staff will assist you in making the ideal plant purchase!